The other day I found something unexpected. Generally speaking, yeast can reproduce both sexually (by sporulation) and asexually (by budding). Brewers yeast, primarily reproduces by budding. (1) However it seems that the cells at mark (B) may be another form of reproduction. The cells at mark (A) is budding. A new cell can be seen forming on the upper left side. Also notice one birth scar in the middle and a second scar on the lower right of the cell. 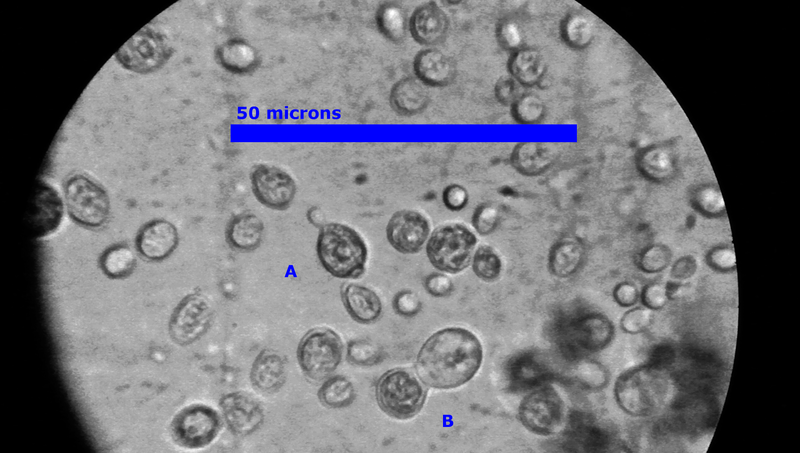 The cells at mark (B) seem to be conjoined cells, although this coud be a budding cell that has not separated. These do not appear to be flocculation, as flocculation look similar to grapes in a bunch. Floculating cells are very close to each other and may have slightly flat sides because of the proximity. An example of this are the dark cells above mark (B) and to the right of mark (A) The cells at mark (B) the membranes seem to be pulled toward each other instead of being pressed back toward the cell. Although with the resolution limits of a bright field microscope this could be an optical illusion. In Sporulation, two haploid cells, each having one copy of each chromosome, combine to form a diploid cell. This can occur when the yeast is under stress. The resulting is four yeast spores that each have different DNA from the two parents. The yeast cells that result from sporulation are therefor genetically different than the parents rather that the direct copies that are formed during the much more common budding reproduction. It's really quite a fantastic world that yeast live in, and since getting this microscope my understanding of it has increases several fold. This is likely simply budding that is further along in development. See the comment below. It's good that you're aware of sexual reproduction of yeast. There are a lot of brewers who think budding is the only way. However what you have there is just budding. Sporulation is spore formation, not diploid formation and spores are quite a bit smaller. It's actually pretty easy to induce sporulation in yeast, but in homebrew setting I've only ever seen it under stress. Check out a pic I snapped here (http://bkyeast.wordpress.com/2011/09/23/looking-at-wyeast-berliner-weisse-brett/). The pic quality isn't that good (it's hard to get good ones at home) so I can't comment about scars. However as far as I know you can't really see them in brightfield that well. Staining or electron microscopy is usually used, but I could be wrong. Nice blog! Thanks for the information. I'll updated the text.